Integral, and wholly owned subsidiary ElectriPlast Corp, engage in the discovery, development, and commercialization of electrically conductive hybrid plastics used primarily as raw materials in the production of industrial, commercial and consumer products and services worldwide. Its core material, ElectriPlast®, is a non-corrosive, electrically conductive resin-based material whose properties allow it to be molded into any of the infinite shapes and sizes associated with plastics, rubbers and other polymers while reducing component weight by 40 to 60%. 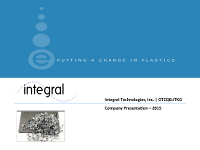 Integral is a leader in conductive hybrid plastics with a broad Intellectual Property portfolio referencing its ElectriPlast technology. Applications for ElectriPlast include: Shielding Wire, Power Electronics, Connectors, and Cables; Shielding, Conduction, Batteries, Semiconductors, Heated Elements, Sensors, Antennas, Medical Devices, Consumer Electronics and Acoustics, Fuses, Capacitors, Resistors, RFID, Bus bars and Terminals.